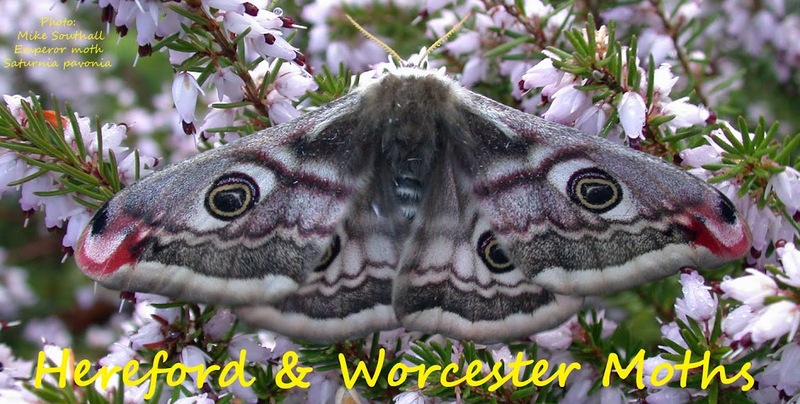 Hereford and Worcester Moths: That Old Chestnut Again! Back home in Warndon, the garden Robinson was put away at 00:35 due to a strengthening wind arriving. 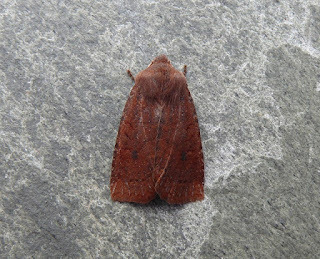 Next morning one solitary noctuid may be the richer red form of Dark Chestnut. Much discussion has been 'aired' on these over the years and slightly worn ones in spring following hibernation can present a challenge! The hind edge of the forewing looks reasonably straight and the apex is almost square. Small but quite distinct whitish spots are present along the costa. If anybody thinks it is 'just a Chestnut' I am sure you can let us know! It looked 'different' to the 10 or so Chestnuts seen in the nearby wood the night before. Looks good to me Steve.